Review Summary: A shuttlecock gaming session for buddies Gaurav Manav Pankaj and Loveleen is the beginning of many-a-new innings. Shuttlecock Boys with a simple story mostly overpowered by an incessant need to pack tons of mush moments, succeeds in being a good film, offers sprinkle of light-hearted chuckles and a feel-good sensation that lingers on. Shuttlecock Boys is definitely not a classic that will go down in history but it sure is a decent first attempt and makes for a one time watch. A shuttlecock gaming session for buddies Gaurav Manav Pankaj and Loveleen is the beginning of many-a-new innings. 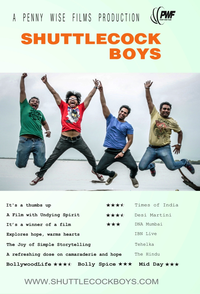 Boy bonding – as real as it gets!